Akash Engimech India Pvt Ltd. Welcome to Akash Engimech (India) Pvt. Ltd.
One of the largest manufacturers and suppliers in Gujarat, we manufacture, export and supply our wide range of Porta Cabins for every field whether it be a Construction Industry or Oil & Gas Sectors. 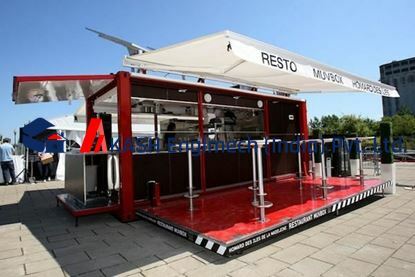 We work with all the Industries to fulfill their requirements of Modular Porta Cabins, Prefab Buildings, LGSS Modular Constructions. Known for the highest quality Porta Cabins in the market, we are leading the industry with our wide range of Porta Cabins & Site Containers. Becoming a prominent name in the Porta Cabin Industry, we bring to you our varied range of Products always upgraded and modernised as per the latest technologies and qualities. Here, you can stay updated about all our products and recent projects. Our Research & Development Team being continously at work keeps developing newest range of Products in Market with an aim to always upgrade as per Market Demands. Following is the list of our Upcoming Products to be introduced in the market. Sounds unique! But yes, New Age Construction is Container Building. Sounds Thrilling !!! Yes, Anywhere anytime. Container for you.